iOS Screen Time vs. Android Digital Wellbeing: Which phone addiction fighter is best for you? Which phone does a better job of helping you put down your phone down? Digital Wellbeing vs. Screen Time: Which is better? Regardless of whether you use an iPhone or an Android phone, you’re about to learn a whole lot more about how often you use apps. Both Apple and Google have baked into the latest versions of their mobile operating systems new tools that aim to help people get a handle on how much time they spend with their phone. Beyond that, these tools let parents set limits on how much screen time their kids can have each day. Both are in beta form and arriving later in the fall, but we’re had a chance to try them out. Here’s how they compare. Digital Wellbeing: Pixel only at launch, coming to Android One and other devices later this year. Screen Time: Any iPhone 5s, iPad mini 2, iPad Air, iPad Pro, or iPad (5th generation) or later, running iOS 12. It’s not clear how many Android phones will get to take advantage of Google’s Digital Wellbeing, but it will probably see relatively wide release to Android Pie devices. But at launch, Apple clearly supports a far wider range of devices. Plus it will collect data from all of your devices, not just the one you’re using. Make sure you have a Pixel phone. Upgrade to Android 9 Pie. Go to the Android Digital Wellbeing Beta site and enter your email address. Wait for an email confirmation from Google. Make sure you have an iPhone 5s or later. Sign up for the iOS 12 Public Beta. Once the official version of iOS 12 lands in September and Google takes Digital Wellbeing out of beta, the set-up process should be as easy as signing into your iCloud and Google accounts. Both Apple and Google break down phone usage by app in a visual way to let you see at a glance how much time you spend with your phone. With Digital Wellbeing, you’ll see a pie chart as soon as you open it, with the amount of time, unlocks, and notifications received all front and center. The Dashboard in Android’s Digital Wellbeing (left) is easier to read at a glance. 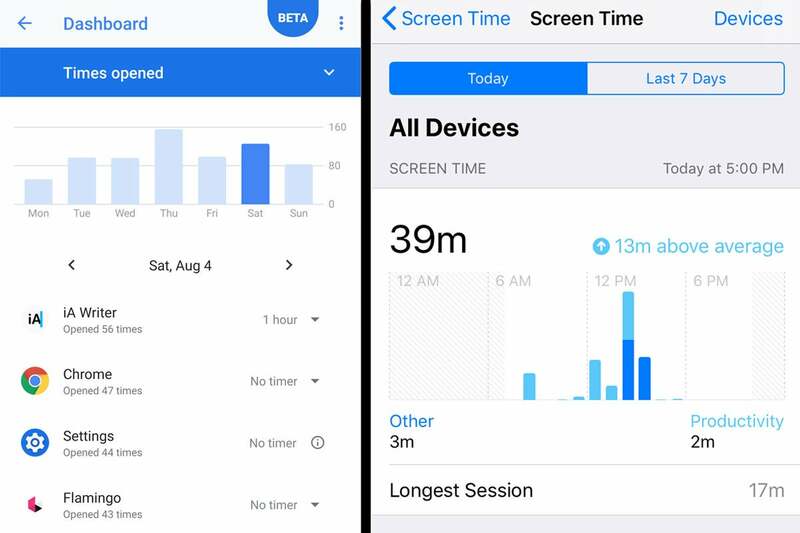 Apple’s Screen Time also tells you how long you’ve been using your phone, but you’ll need an extra tap to see a chart. The data presented is more useful, however. Apple’s Screen Time will show how many times you’ve picked up your phone, along with an average and the hour that you did it most. Notifications are also broken down by app and time, and it also shows the longest stretch that you used you phone without putting it down. Surprisingly, Google’s simple and elegant chart presentation is superior. You can quickly open Digital Wellbeing and get a quick overview of your phone usage without needing to scroll or tap, and instantly see which apps are taking up the most of your time. At the center of both digital health strategies is the ability to put limits on how much you use your apps. But they’re quite different. In Digital Wellbeing, Google lets you set limits for any app (aside from Settings or any other system function). All you need to do is enter your Dashboard and tap an app to set a timer. Once the limit is reached, the app icon will turn to grayscale and if you try to tap it, it will let you know its timer has run out. Apple’s Screen Time (right) focuses more on app categories than individual apps when it comes to limits. Apple also allows timers, but the system is different. 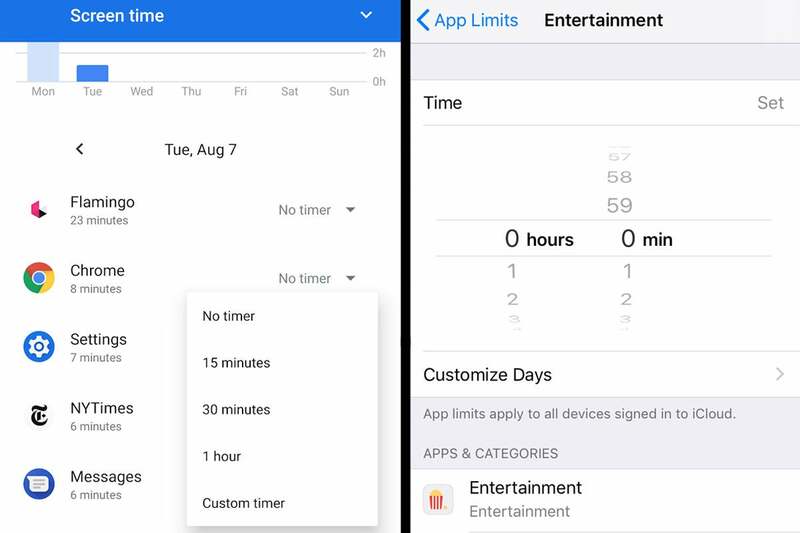 On the main Screen Time page you’ll see an App Limits tab. Tap it and you’ll be able to set limits for categories of apps, such as creativity, entertainment, or games. You can’t pick and choose the apps that are inside these categories, however, so if you put a 60-minute timer on games, for example, you won’t be able to play any games on your phone once it’s up. If you want to set a limit on an individual app, you’ll need to go find it on your dashboard, which could be tricky. But as long as you can track it down, you’re able to set an individual timer for any app on your phone (except Settings). And finally, there’s also a feature called Downtime that shuts down all apps except for the ones you choose to keep available. No matter which method you choose, when the limit is reached, the related app icons will dim, and a tiny hourglass will appear next to them. When your app timer has been reached, the icon will desturate in your Android app drawer (left, circled in red), while Apple dims the icon and adds an hourglass. Once the timer runs out, both systems will restrict your usage of the app. When you try to open it on Android, a box will appear telling you that the app is paused. On the iPhone, a full-screen message will tell you that you’ve reached your time limit. However, neither system locks you out completely. You can press the Learn more button on your Android phone to adjust the timer limit inside the Digital Wellness settings. Similarly, the Ignore Limit on your iPhone offers a pair of options: Remind Me in 15 Minutes, which extends the time for a quarter-hour, or Ignore Limit For Today, which turns it off completely. Both systems do a fine job of letting you set limits on the apps you use the most, but Google’s granular settings are a little easier to use. However, Apple’s quick time extensions for apps that have reached their limit is quite useful. In addition to app limits, Apple and Google have both added new Do Not Disturb features to their digital health initiatives. While the core functionality is the same on each—setting a period of time where notifications won’t bother you—they differ in one key area: the end of the day. Do Not Disturb is a major component of both Apple’s and Google’s digital heath initatives. On the iPhone, when you set a Do Not Disturb schedule, you’ll also get the option to set a Bedtime Mode. 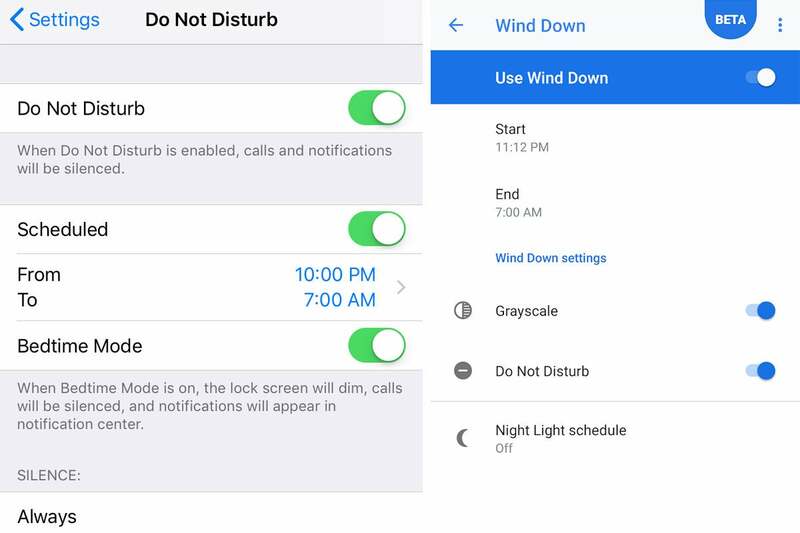 In addition to silencing calls and sending notifications straight to the notifications center, it will also dim the lock screen so you won’t be disturbed overnight. Google has a similar system called Wind Down. It too will silence calls and notifications, but rather than dimming the lock screen, it desaturates the entire screen, giving you a black-and-white view of your home screen and apps instead of color. The idea is to give your eyes a rest so you can fall asleep quicker. Obviously, these are two very different approaches. While Google has built its system around the assumption that you’ll be using your phone in bed at night, Apple is more focused on making sure your phone won’t disturb you when it’s on your nightstand. This is the big difference between the two system: Google’s Digital Wellbeing isn’t really built for kids, it’s built for users. There’s a separate app for parental controls that has been available for a while now called Family Link, and it lets parents remotely monitor their kids’ phones and set limits on what they can and can’t do. Apple combines that all into Screen Time via Family Sharing. It works similar to Google’s Family Link, letting parents restrict content, set bedtime schedules, and, of course, limit app usage. And since it’s all behind a passcode, little ones won’t be able to ignore the limits like their parents can. Like Screen Time on the main phone, it works across all iOS 12 devices. It’s hard to pick a clear winner here. While both platforms could stand to improve in some areas, they both will help users get a grip on their digital lives. I preferred Google’s dashboard to Apple’s, but users will be happy with each and I don’t see anyone switching platforms for the other’s method. 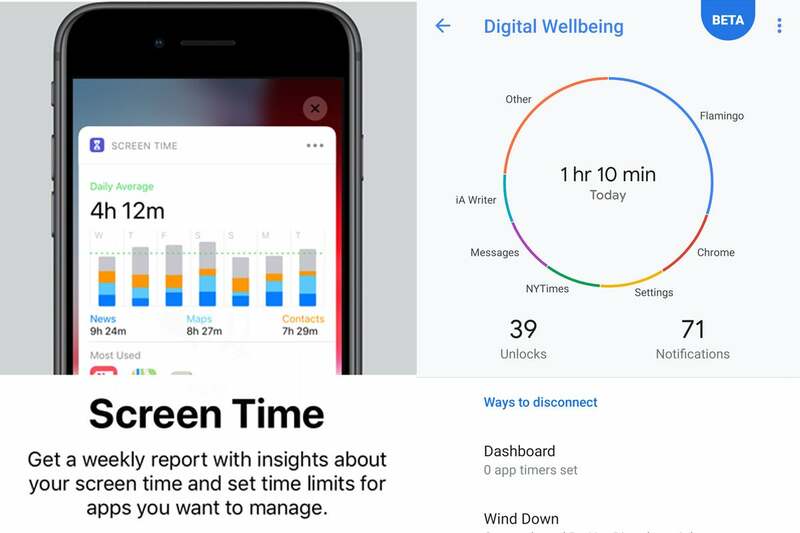 That being said, Google’s Digital Wellbeing seems to be a bit more thoughtful and elegant than Apple’s. Since it has a separate app for parental controls, Google was able to focus on individual usage rather than trying to cover all possible cases. But Apple’s system is a great first start and I suspect it will improve quickly. Both are long overdue, and it’s great to see this topic finally getting attention from folks that can do something about it.